(Another) surprising cost in the wedding planning arena was stationery – one that perhaps defied belief the most. 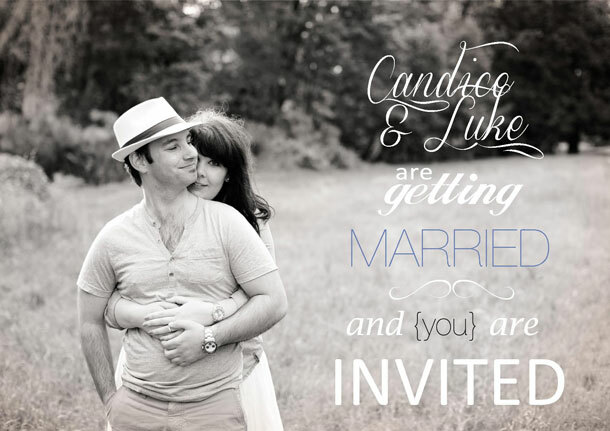 I discovered there are entire companies dedicated to wedding stationery – that will design everything from thank you cards, save-the-dates, invitations, programs, seating charts … if it has words, they will do it. And please, I am not trivializing the wonderful work designers do, a well-designed logo or page is a work of art, but if you are trying to save costs, this is a great place to do it. It requires a little planning, but start scouting for friends who are slightly design-inclined, or have a few basic Photoshop skills. You’ll be amazed as what is possible with a little time and patience. Alternately, there are also some beautiful templates online (many of them free or available to purchase cheaply) – simply find the design you love and insert your information. That simple. 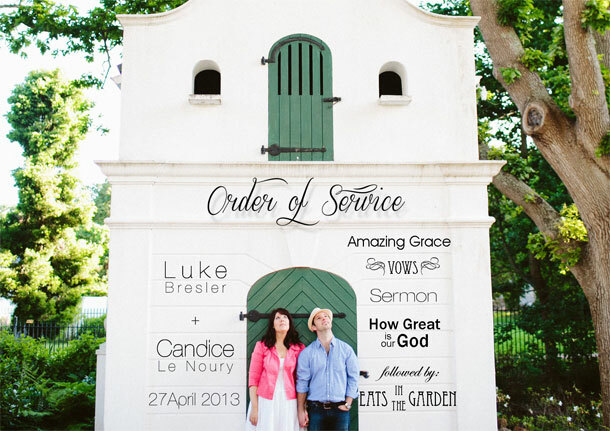 Our save-the-dates, wedding invitations and order of service followed the same “theme”: a photograph of us from our engagement shoot, with typography over it. It was simple, easy and only cost us to print it. For our place cards and wedding favour tags, I was lucky to have a bridesmaid with beautiful handwriting, who was happy to write them out for me. If you mention you need help, most people will jump at the chance to be involved in your special day. Looking at it now, it seems a little crazy – this long list, and ONLY for stationery? Especially when there’s so much else to remember and pay for? We didn’t use everything on this list – and you may not either, depending on the nature of your wedding. Love this idea, too cute.